As we get closer to welcoming students to our unified and expanded Tower Road Campus (TRC) this September, I am pleased to provide an exciting update on our One Grammar vision and project. Purchase of 909 Tower Road: We have just completed the board-approved acquisition of 909 Tower Road, the lot on the corner of Tower Road and Atlantic Street. This means we now own all three Tower Road lots extending from the TRC south to Atlantic Street. 13,440 square feet of new green space: The three houses will be safely and responsibly demolished and the three lots converted into a 13,440 square-foot green space for the enjoyment of Grammar students and our community - a rare and wonderful opportunity for us in the South End of Halifax. Playground closure: We will keep you advised if it becomes necessary to temporarily close the TRC playground and/or pick-up/drop-off area during school hours to accommodate site demolition and development. While we can all be very proud that Grammar has been able to secure all three lots over the years for the creation of much-needed green space on Tower Road, our number one priority continues to be the safety of all students and community members who could be affected by the One Grammar construction project. As was our practice with the demolition of the TRC theatre one year ago, all three houses were tested for hazardous materials and asbestos was found. This is common for homes constructed prior to 1980. As part of the demolition strategy led by our construction partner, Armour Group, trained asbestos removal professionals have been hired to manage it is safe and responsible removal and disposal. We will continue monitoring the demolition strategy to determine if and how it could affect students on the TRC playground and those using the drop-off and pick-up area. We will provide you with updates should conditions dictate. As always, many thanks to you for your continued support and encouragement as we look forward to securing a strong, sustainable future for Grammar – one where our teachers and students come together on a single Tower Road Campus, inspired by our foundational premise to challenge conventional thinking and aspire to excellence. The One Grammar vision and Engaging Excellence campaign represent a 100% Grammar-community-led and funded initiative. Regional Council approved our plan unanimously, with support from City staff, the Peninsula Halifax Planning Advisory Committee and the Heritage Advisory Committee. The broader Halifax community will benefit from our new gymnasium (league games, tournaments) and theatre/multipurpose room (live performances, meetings). We are preserving and updating our original, historic Tower Road School building. We maintain an open dialogue with you, our neighbours and other stakeholders, to inform you of our progress and to better understand and address your interests and concerns on an ongoing basis. Since our last update on April 25, 2018, our Capital Campaign total has grown from $9,250,000 to an extraordinary $9,600,000. Many thanks to the continued commitment of our community to the future of Grammar. Now, with less than a month until the end of the school year, we still have $400,000 left to raise! So, please, make your meaningful donation to Grammar today. Let’s mark the end of the school year with ten million reasons to celebrate. Just eighteen months ago, we set in motion our One Grammar dream. Since then, we have made extraordinary progress, including 100% participation from faculty, staff, and the Board, as well as receiving many significant gifts from our Grammar community. As a consequence, we are now closer than ever to reaching our $10 million goal. In fact, in just the three months since publicly launching our Engaging Excellence campaign, we have reached $8.5 million. Certainly, this is an impressive, indeed unprecedented, achievement. But aspiring to, and reaching, such excellence is something Grammar has always done well. Many times over the past year and a half, I have reflected on our sixty-year history. Proudly independent, Grammar has always been funded solely by our community members. That is to say, we have always looked to our own community to realize our dreams. For examples, I encourage you to visit our Engaging Excellence Campaign website, onegrammar.ca, where you will not only see our updated campaign roadmap and reflect on our fundraising progress to date, but you will read two new donor profiles: alumni parents Brian MacLellan (Aleka '08 and Niko '10) and Gordon Stirrett (Scott '09), who continue to commit themselves to Grammar’s dreams. They share their personal stories of altruism and leadership in the Grammar community. We are certainly grateful for the generous support we have received so far from students, parents, and community members. Still, there is much work to do. If you have yet to offer your gift to Grammar, I ask that you contact Tania Blunden at 902-431-8565 and arrange a meeting where we can talk about the One Grammar dream and how your generosity will ensure we continue to challenge conventional thinking and aspire to excellence. As always, thank you for your continued support and encouragement as we look forward to securing a strong, sustainable future for Grammar. The Engaging Excellence campaign launched publicly on September 14, 2017. Remarkable progress has been made on the Tower Road expansion since we first broke ground less than six months ago, on May 30, 2017. To get a tangible sense of that progress, I encourage you to visit www.OneGrammar.ca, where you can watch our new school come to life in a time-lapse video spanning June 12 to November 16 (click on “Our new home”). In that video, you will see that our roof is now on – just in time for the cold and snow – and more than 80,000 Nova Scotia-made bricks are fast climbing the exterior walls. Soon to follow will be more than eighty windows and the glass of the extraordinary atrium. Then, around the holiday break, we will begin our work on the interior. We have so much to celebrate – and still so much still to do. Almost sixty years ago, our founders – parents and supporters like you – started Grammar with a simple mission: challenge conventional thinking and aspire to excellence. They modeled this mission by giving generously, both physically and financially, to create this exceptional school. Then successive generations of Grammar parents and students, alumni and friends, inspired by the founders’ generosity and vision, continued with a similar passionate commitment, investing in Grammar’s continued growth. Now, it is our time to make a difference. Thanks to the generosity of so many of you, we have made significant progress toward our goal of raising $10 million dollars. In fact, we have only $1.6 million left to go. It is important to emphasize that every contribution, no matter the size, makes a significant difference. Each is a meaningful step toward realizing our One Grammar vision. To help in this progress, please contact Tania Blunden at 902-431-8565 to arrange a meeting where we can discuss how your support will ensure Grammar continues its mission of helping students and faculty challenge conventional thinking and aspire to excellence. September 14, 2017: Engaging Excellence campaign launched publicly. May 30, 2017: Ground broken on new Tower Road Campus expansion. I do hope your Thanksgiving weekend with family and friends was both restful and enjoyable. On September 14, hundreds of Grammarians – teachers, students, parents, alumni, and friends – were on hand at the annual Ice Cream Social to share in the launch our Engaging Excellence Campaign public phase. In the course of that event, we unveiled our “Road to Success,” with the exciting news that we had reached 82% of our $10-million goal. Certainly, this is an extraordinary achievement. Yet, there is much work left to do. We still have $1.8 million to raise, and every contribution – no matter what size – makes a meaningful, tangible difference. Indeed, only working together will we will reach our goal of realizing our generation’s vision of achieving excellence. Fifty-nine years ago, our founders were the first generation to give generously to Grammar. Since then, in each successive generation, others have similarly given to realize another iteration of Grammar’s vision of excellence. Now it is our turn to realize Grammar’s greatest dream yet. I look forward to working with you in reaching our goal. Regional Council approved our plan unanimously, with support from City staff, the Peninsula Halifax Planning Advisory Committee, and the Heritage Advisory Committee. Halifax (September 15, 2017) – Hundreds of Grammar family members, faculty and staff gathered last evening at the independent school’s annual Ice Cream Social to officially launch the Halifax Grammar: Engaging Excellence capital campaign inspired by the independent school’s foundational premise to support an experience that goes far beyond the classroom. Headmaster, history buff and award-winning author Steven Laffoley recounted the story of the school’s founding noting that 22 parents - academics, professionals and radicals - were driven by their shared vision to mortgage their homes to purchase the first Grammar School building in 1958. The campaign’s $10 million goal is the largest private investment in independent schools in Nova Scotia, and will unite the Tower Road Middle School and Atlantic Street Preparatory and Senior schools in a single Tower Road campus. Holly Dunn is a Grammar alumna and campaign supporter whose two daughters now attend the school. “Every time I enter the school I get a warm, family feeling and I’m reminded that Grammar made me who I am today - this school is a gem,” she told the group, her eyes tearing her up slightly. While there is still $2 million in fundraising work to be done, Laffoley acknowledged the extraordinary character and exceptional commitment of Grammar students, parents, teachers, alumni and friends. The school expansion – designed by Halifax-based Architecture 49 and constructed by Armour Construction Ltd. – boasts a state-of-the-art learning commons, a double gymnasium, science labs, a media arts room, and collaborative workspaces that support 21st Century learning. In addition to reducing operating costs, the new building will also provide Grammar and the broader community new spaces for public and private athletics, arts, and community events. The Tower Road expansion is scheduled to open in September 2018. Nova Scotia’s largest-ever independent school capital project: $14.5 million will cover construction, land purchases, furniture and equipment, professional services, and an appropriate contingency. School mission and One Grammar vision align with Ivany Report’s call for Nova Scotians to lead their own recovery and sustainable growth. Halifax Regional Municipality Council unanimously approved Grammar’s campus plan, with support from City staff, the Peninsula Halifax Planning Advisory Committee and the Heritage Advisory Committee. The broader Halifax community will benefit from Grammar’s new double gymnasium (league games, tournaments) and theatre/multipurpose room (live performances, meetings). Grammar is committed to continuing its open dialogue with community, neighbours and other stakeholders. Click here for Grammar's Engaging Excellence campaign, One Campus vision, and drawings. At Grammar, we believe in challenging conventional thinking and aspiring to excellence in everything we do, with a liberal arts curriculum focused on the four pillars of academics, the arts, athletics and altruism, Grammar students and their teachers are known as critical and creative thinkers and leaders in their areas of interest. Founded in 1958 by 22 academics, professionals, and radicals who believed “we can do better” when it came to educating their children, the Halifax Grammar school now welcomes 500 children from junior primary through grade 12, is a Canadian Accredited Independent School, and is Halifax’s only independent International Baccalaureate® World School. I hope you and your family have had a restful and rewarding summer break and that all are ready for what promises to be an extraordinary year at Grammar. If you have not seen the Tower Road Campus (TRC) since June, I expect you will be in awe of how much progress has taken place. The new building is nearly framed up and will soon be ready for exterior walls and a roof. Details: The berm that once separated the playground from the Tower Road sidewalk has been removed to craft a new, one-way lane for student drop off and pick up. The entry point of this new driveway is located at southern end of the TRC (nearest Atlantic Street) while the exit is situated at the north end (where cars once entered the parking lot). This new driveway has been designed with student safety as our priority. Signs have been installed to clarify how cars should proceed, and staff will be on hand each morning and afternoon for the first two weeks to ensure the safe movement of vehicles and students. The exit from the TRC driveway will be right turn only. This will allow for more efficient movement of traffic back onto Tower Road. Parents wanting to drive to the ASC need only take three further right-hand turns. I understand and appreciate that the above changes will be inconvenient for some. However, these are the necessary steps we must take toward the realization of our one-campus dream. As always, many thanks for your continued support and encouragement as we look forward to securing a strong, sustainable future for Grammar – one where our teachers and students come together on a single Tower Road Campus, inspired by our foundational premise to challenge conventional thinking and aspire to excellence. I hope your summer is going well and that you are enjoying the wonderful weather. I wanted to take this opportunity to update you on our One Grammar project. 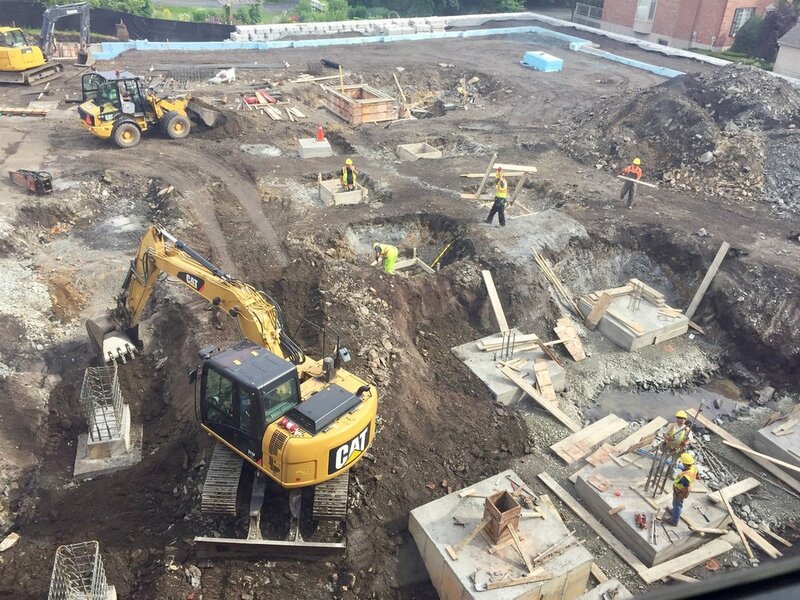 Starting this week, and continuing through the summer, construction crews will finish the footings, complete the foundation, and introduce the structural steel that will create the frame of our new building. We expect this frame will be completed before school starts in September and will be the last step before walls and a roof enclose the structure. Photo: The Tower Road Campus construction zone. As our building now rises from its foundation and redefines our school, we can fully appreciate the scale of our One Grammar vision for a unified and expanded Halifax Grammar School – a new home in which our teachers and students come together, inspired by our foundational premise to challenge conventional thinking and aspire to excellence. For our neighbours to the east, additional hoarding will go up as per safe construction practice to control dust and debris from foundation and building frame installation. We recognize that living next to a construction site is not easy. We do appreciate your patience and welcome your questions and concerns at any time. Do enjoy the remainder of your summer. I look forward to providing a back-to-school update toward the end of August. P.S. These One Grammar updates are now archived for easy reference in the new "News and Events" window on our Engaging Excellence page. Click here for Grammar’s Engaging Excellence campaign, One Campus vision, and drawings.